May 7th 2013. I met my wonderful precious little baby girl… And then she died. As we buried our daughter, I buried myself in a dark coffin of tears, grief, emptiness, heartache and excruciating pain. Frank and I left to France for two weeks after her funeral, to try and find some peace in the healing forces of nature. And in a way, we did. When we got back, the form of my grief had already changed a little bit. I went from having nothing but dark and sad days, to having a few better days in between. I focused on this blog, on her space at home, and on trying to find ways to honor her short but precious life. Looking for ways to keep her in our lives forever, I felt better, I felt closer to her, I felt a stronger connection to her. The days were bearable. We could see an evolution. 3 bad days, then a good one. 2 bad days, then a good one. 1 bad day, then a good one. I never evolved to “Half a bad day, then a good one”. As I left work on tuesday, I was relieved to know I would be able to breathe again on wednesday. I was looking forward to another good day. Trusting on the rhythm of the weeks before, I thought wednesday would be a better day. It wasn’t. It was a day of heartbreak, sadness, tears, why’s and what-ifs, and a very strong, raw revival of her loss. Somehow I was able to drag myself out of the couch for a few hours. I kept myself physically occupied with cleaning the house, while my mind was occupied grieving. I got myself together and drove to the store. While I talked to a good friend over the phone and wandered through the different departments of the supermarket, I fought the tears the best way I could. People that crossed me looked at me, then quickly looked away as if they’d seen a ghost. I got home and finally gave in to my grief in physical form. I wept and cried while I lied in the couch. It started to get late… It wasn’t getting dark just yet but it was around dinnertime and the streets got quiet. Silence took over. Silence gives me the space to be alone with my grief. As that may sound unhealthy or bad to outsiders, it actually brings me comfort at times. Tears stopped flowing. As I stared into the void, Frank asked if there was anything he could do for me. I said “I don’t understand, I already had a bad day yesterday, how come today is so crushing? It’s even worse than yesterday…” He held me, and told me that it was okay. “Take your time to have a bad day, or even two. Cry, weep, be sad… it’s okay, it will get better again“. So that’s what I did, I continued that day submersed in intense grief hoping that the new day would bring some peace back into my heart and mind. It didn’t. As I woke up this morning, I felt this crushing feeling over my chest that’s typical for my bad days. I thought to myself, come on, ignore this, be strong, you can do this. I got out of bed and went to work, hoping this feeling would fade during the next hours. It didn’t. And it probably won’t for the rest of the day. But finally, I know why. I now know why I’m having these several bad days in a row experience again. I checked my work calendar to book a meeting, and that’s when it hit me… It’s June 27th today… I would have been 30 weeks pregnant with Sahar today. We would have celebrated today. The big countdown would have started today. But it’s a very different reality. When I got pregnant, Frank and I agreed to celebrate each completed 10 week interval with a special dinner. We celebrated her 10-week life in the intimate surroundings of our home. We celebrated her 20-week life even more. We had actually reached mid-term! We dressed up and went for a very romantic dinner in a fancy restaurant. That entire evening was filled with conversations about our life with Sahar in it. It was a beautiful evening… Since we enjoyed ourselves so much that evening, and because I was a planning maniac, I looked up when I’d reach that 30 week milestone of my pregnancy. I engraved that date into my mind and was looking for good ideas to celebrate it. It seems like somehow, my subconscious mind remembered that date, although that my conscious mind erased it just like I erased all those events in my calendar. My subconscious was even more aware of the should-haves and would-haves than my conscious minds, and it reminded me with raw feelings of pain and vivid images of her loss. Although it might seem crazy, I am really grateful for it. I am grateful that even when I fail to remember those very special small events, my subconscious does it for me. 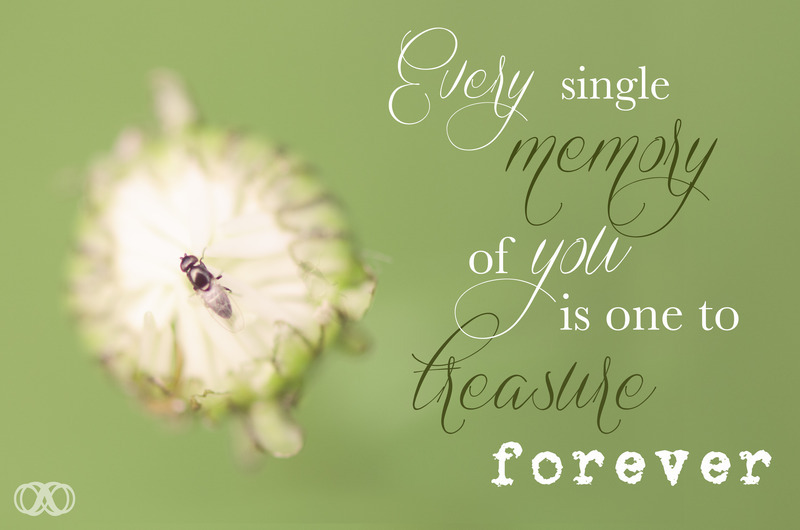 Because every single memory of Sahar, is one to treasure forever.